UFC welterweight champion Georges St. Pierre tweeted that he has been medically cleared to return to MMA action on Tuesday which should be a welcome sign for the UFC brass. He has been sidelined since last December with a torn ACL which happened while training to defend his title against Nick Diaz at what would have been UFC 137. Carlos Condit went on to defeat Diaz in a controversial decision at UFC 143 to be crowned the interim welterweight champion and is tentatively scheduled to face GSP at UFC 154 in November. It’ll be interesting to see what effect GSP’s return will have in regards to PPV buys and the UFC welterweight division. GSP was very close to cleaning out the division after defeating Jake Shields at UFC 129, but this injury has allowed new contenders to emerge from the pack. There are fighters like Johny Hendricks, Martin Kampmann, and Nick Diaz that are all vying for a shot at the champion if he gets past Condit. There’s no doubt that his return will be heavily anticipated and the event will do large numbers as he was arguably MMA’s largest PPV draw prior to the injury. 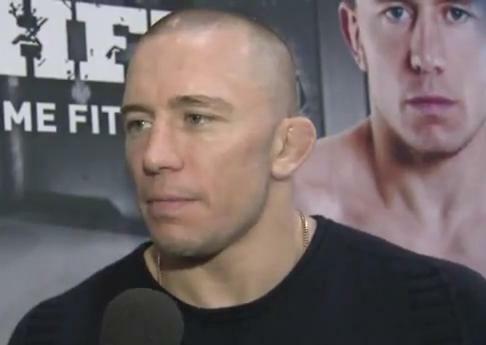 Fans and media seemed to criticize St-Pierre following his win over Shields, claiming that he fought ‘too safe’ and never finished his opponents despite dominating them in almost every facet of MMA. However, he has gone to a judges decision in five out of his last six fights with the lone finish coming against BJ Penn at UFC 94 in 2009. It’ll be interesting to see if GSP will be able to return with the same qualities that made him the best welterweight on the planet prior to the injury. Will he have the same explosion on his takedowns? Will he be able to go five rounds without gassing? He’ll be facing a tough opponent in Carlos Condit who is very durable and has cardio for days, and I suppose we’ll find the answers to the questions in November if training camps go off without a hitch.